Mama of 10 : Baby #10 due March 10! Baby #10 due March 10! Now that I've had 2 good doctor appointments and I'm officially out of the first trimester, we thought we would make it public (not that my kids haven't told about 100 people already : ) But we are expecting again and I am due March 10! I was a bit shocked (I'm getting a little older now and thought it wouldn't be quite so easy to get pregnant.) We are very happy though and the kids are thrilled. It's so wonderful how children are always so excited about another baby in the house and another sibling to love. God is good and we do feel so very blessed. It's been a rough month though, with the morning (really all day) sickness. I'm so glad to be feeling somewhat better. My children are glad that I am cooking again :o) Usually my morning sickness is completely gone by 14 weeks so only one more week to go. Coffee is sounding good again so I must be on the upswing. We have gotten a few negative comments from some extended family members but we have gotten so many positive ones, which are encouraging. I'm so glad our church family and friends value life and trust that God is in control! I'm a lurker on your blog, but I do enjoy reading it! I'm amazed at how organized you are with 10 kids--I'm expecting #2 in October and I feel like I'm always a day late and a dollar short. I hope you have a healthy pregnancy and that the morning sickness ends soon! this is such wonderful news! congratulations to you and your family! my husband and I were just talking on the beach yesterday about how we'd love another. we have 4..but I recently turned 42. But isn't that the new 32?? Best of luck and look forward to reading along during your pregnancy! Love reading your blog. I am soooo excited about baby # 10! How wonderful!!!! You are my hero. Congratulations! SO envious. What a beautiful family. Congratulations!!! I just found your blog and really enjoy it. I am almost 41 and still hoping for more. Babies are such a blessing. I'm a somewhat new lurker and wanted to say congrats! :) I have a 10 month old and we want a big family. 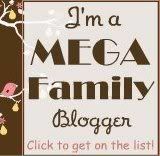 We don't really know anyone who believes as we do, so it has been an encouragement to find your blog! Congrats! What wonderful news. I love reading your blog and hearing about your beautiful family. Awwww.....congratulations! Wonderful news. I am 41 and we hope to have more. We had a #10 on the way not too long ago but lost that little one to miscarriage in the 11th week. Such a hard loss for us. But we trust God to know what is best. Perhaps He will bless us again soon -- who knows! Sooo excited for you & your family!! How wonderful! :) I hope you start feeling better soon. Congratulations. I love reading your blog. Sometimes knowing someone else goes through the same obstacles I do is a comfort. We're hoping to get our # 10 someday too. I hope you have a good pregnancy and an easy birth. love reading your blog and seeing all the pictures of your beautiful family! Congrats!! I am in awe of you!! You are such a good Mom role model!! Congratulations, Becca! So glad you're feeling better. You must really be on the upswing if coffee is starting to sound good, again. :) I cannot believe you got some negative comments from extended family! All of ours gave up on us by the time #6 came around. What a blessing to have such a supportive church family, though. I'm sure your youngest will make a terrific big brother! Congratulations! Sorry some family members have been negative. We get negative comments sometimes too and we only have 3 children because my husband is still in school. We know that children are a blessing - maybe one day we will have 10 children as well! So happy to hear your wonderful news!!! Blessings to you and your beautiful family. Hi, just found your blog through another ds blog.. we have 10 children, the youngest of whom has that magical extra something:) Congrats on your pregnancy! congratulations. Number 7 and 8 for us were 5 years apart and I was starting to think that number 7 was it but God obviously had other plans. Enjoy the second trimester. I love that stage of pregnancy. I will be praying for you and your baby through your pregnancy.